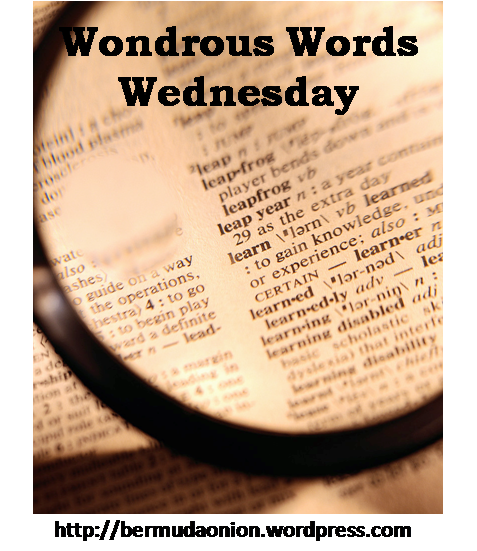 My first word this week comes from Marriage and Other Acts of Charity by Kate Braestrup. In this case, imprimatur means sanction or approval. My second word this week came from Booking Mama’s interview with Laurie Perry, the author of Home is Where the Wine is. Entrelec isn’t in my dictionary, but according to Wikipedia, it’s a knitting technique used to create a textured diamond pattern . My third word this week comes from my Word-a-Day calendar. Demesne has several meanings, all related to land. In this case, it means region or territory. Both demesne and domain came from the Anglo-French term demeine. A good list – I want one of those calendars! Such interesting words. And it’s always interesting to me when I can’t find a definition for one in the dictionary. I used to think the dictionary had all the answers–now I know differently! ha. Three interesting words, and all new to me. Thanks for the shout-out! I asked my husband about the first word from MARRIAGE! Entrelac is the only one I know and only because, as a knitter, it is a technique that eludes me. I have some new words and you can find them HERE. I had a lot of non-dictionary words too! In fact, my list was so incredibly long, I have broken it into three posts (so stay tuned). The words are all from Outlander. They all sound like great words. I’ve heard of them but never knew the meaning. Mine is posted at my place. Have a great day! Demesne is such a lovely sounding word – in my mind, it’s all misty-like! I like entrelac. I can’t say it without rolling the r.